The next day, neither woman can shake the memory of the brief kiss and both decide to track each other down. But it's not as easy it looks. Sam and Tilda race around the city in the countdown to Christmas, dealing with warring family, job interviews and big life decisions while they try to find one another. But what if they do find each other? Was it just a mistletoe moment? Or is it something worth chasing? A Christmas romantic comedy novella from the author of The Plus One, A Marriage of Connivance and Joined at the Hip. 4.0 out of 5 starsOpposites attract. What a delightful Christmas romance story. It's a funny, quirky tale of two very different women who share a brief but electric kiss at a Office Christmas party that will change their lives. I imagine good old St Nick must be mighty pleased with Ms. West, I know I am! Natasha West delivers again in this short and sweet holiday romance sure to lift the spirits of any grinch. There's nothing to buh humbug here. A kiss is sometimes just a kiss, but a kiss under some mistletoe can bring you the best present you didn't even know you wanted. Such is the case for Sam and Tilda. One kiss serves as the catalyst for what turns out to be an adventure for both women. Each trying out new things in the process of finding the other and holding on to hope. 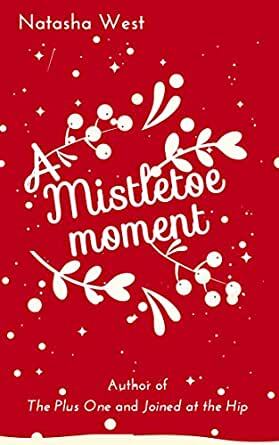 Fast paced and light hearted with the perfect touch of comedy A Mistletoe Moment will have you goofily grinning to yourself. 5.0 out of 5 starsA new holiday favorite! A quick, funny, romantic read just in time for Christmas! The thing I liked about this type of "comedy of errors" story was West didn't belabor and draw out the storyline. For me there is nothing worse than when an author won't just get to the point. I'm done if I find myself swiping through the pages to see when the chapter ends. Natasha West is one of my new favorite authors, and I'm currently making my way through her stories. She writes well and can tell a good lesbian story. What more could you ask for? This was a really sweet story, with wonderful twists and turns. I enjoyed this, and the one other book I've read by this author (so far). She's magical. A perfect Christmas morning read! Easy going, short, funny, relaxed, a little romance and good for your Christmas spirit. I really enjoyed it!